Looking for a great sandwich shop in Yaletown? The folks at DD MAU specialize in Bánh Mì. DD MAU should host a Vietnamese sandwich workshop. First lesson: Bánh mì is a Vietnamese synonym for ‘bread’ or ‘sandwich’ (in case you too, at one point, considered it a specific type of sandwich, like a ‘club’, for example). Ingredients that define a bánh mì are pate, cilantro, cucumber, pickled daikon and carrots, and a protein. 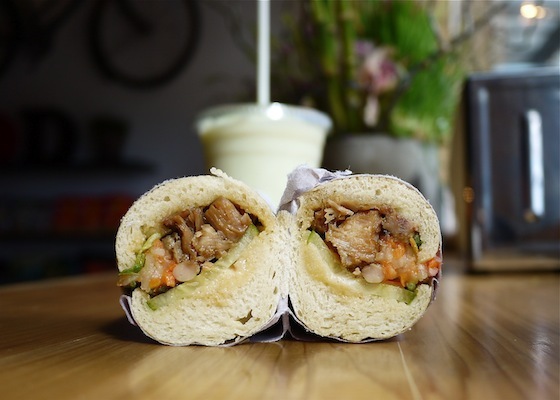 The Vietnamese owners of Yaletown’s newest sandwich shop feature seven baguettes that adhere to their culture’s culinary principles. The Grilled Lemongrass Chicken Bánh mì is nearly floral with sweet chili aioli lathered on a fresh-from-the-oven baguette (choose from white or whole wheat). Its super savory dark meat was tender and plentiful. Boost flavor even more by adding paté or an egg. The sandwich was delicious, but DD MAU’s Honeydew Smoothie, made with almond milk and – the magic ingredient – condensed milk, was what had me raving non-stop. And apparently it’s not even the most popular flavor – avocado takes the cake, which surely warrants a return visit.